Repair corrupted or unrecognized Alcor USB flash drives .Download FC MPTool V3.05 and fix Alcor Au698x ,AU6981 , AU6984 and AU6986 . 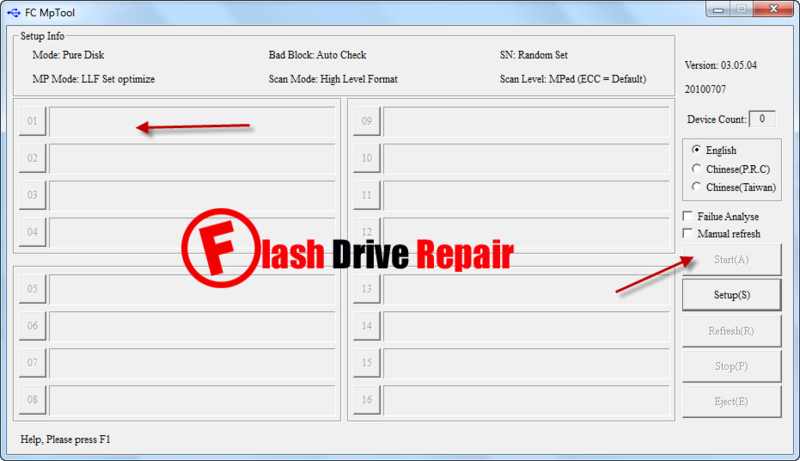 FC MpTool V3.05 is developed to format and repair USB flash drives that have Alcor AU698x . FC MpTool V3.05 can repair alcor AU6981, AU6984 and AU6986 chip controller.FC Mp format tool will erase all data inside your corrupted flash drive while upgrading Firmware .First you must check your flash drive information and must be one of the following chip controllers "alcor AU6981, AU6984 and AU6986 " .You can use Chip genius to determine your USB stick information . Download FC MpTool V3.05 software from the download links in the end of this article . Insert your damaged alcor flash disk to your PC . Open FC MP recovery tool and If your flash drive chip vendor is one of the chips that we mentioned before , you will see your flash drive recognized in the software . Wait until finish upgrading your Pen drive firmware .